Concussion treatment once consisted of one thing; rest, rest and more rest. The logic behind this recommendation is that the brain has been injured and that it needs to rest in order to heal. In more recent years we have started to question and challenge this logic- yes rest is important, but not indefinitly. In this blog I am going to break down some of the new ideas behind concussion treatment. 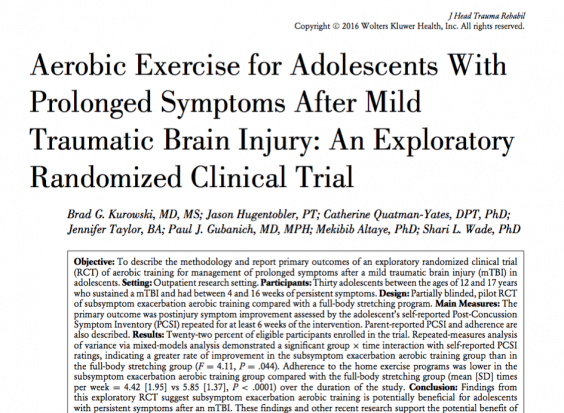 I will also summarize a new paper released on prolonged concussive symptoms in adolescents and the effect of exercise in this population. an estimated 10-33% of individuals have persistent symptoms beyond 1-3 months after injury. We currently do not understand why some people have prolonged symptoms and other do not. It is not currently thought to be linked to severity of injury. Post Concussive Syndrome (PCS) is the label given when concussive symptoms are lasting months to years after the initial injury. New studies are suggesting that implementing light aerobic exercise at around the two-week mark can be beneficial for blood flow to the brain and reduction of PCS. This particular study came out of the Cincinnati Children’s Hospital. They looked at adolescents (12-17 year olds) who had suffered a concussion and were still having symptoms 4-16 weeks post injury. They split the patients up into two groups; a stretching group and an aerobic training group. After the 8-week intervention they were able to show that aerobic exercise was more successful than stretching at reducing concussive symptoms. Exercise is thought to increase cerebral (brain) blood flow, oxygen extraction (taking more oxygen out of the blood), brain metabolism (the brain being able to utilize the fuel the body is giving it) and neuroplasticity (the brains ability to learn and adapt). All of these things are thought to be beneficial during a concussion. Rest is critical immediately after a concussion. Light aerobic exercise should be implemented around 2 weeks post injury. This needs to be implemented properly. This does not mean going back to full contact sports, mountain biking, etc. Exercise needs to be SAFE, you do not want to increase your risk of hitting your head and getting a second head injury. This paper was published in April of this year. This is still relatively new information. As we continue to learn more about this topic we can continue to implement the best care possible and hopefully reduce the incidence and duration of PCS.